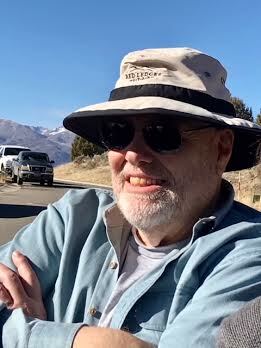 See short article on "Why Arthur Miller wrote the Crucible in the stories section or click here. 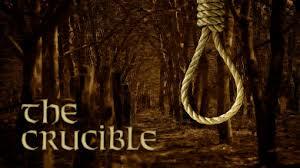 The Crucible: by Arthur Miller is a 1953 play where the Salem witch trials of 1692 are dramatized to be a metaphorical test to reveal inner character. The word crucible is a reference to a container that can resist heat and can serve as a test of strength for what is put in it. The play was written by Miller, as an allegory for McCarthyism, at a time when people were being accused of being communists, much like the way some were accused of being a witch in Salem. The play focused on inconsistencies in a trial and dark agenda that had their own parallels to when, in 1956, Miller himself was questioned by the House of Representatives' Committee on Un-American Activities, and convicted of contempt of Congress for refusing to identify others present at meetings he had attended. The play starts with the Reverend Parris’s daughter Betty, ill and unconscious. Late the night before Parris had seen his niece Abigail, and Tituba, his black slave, dancing in the woods, causing Betty to swoon. The local physician is unable to determine the cause of Betty's illness and neighbors, Mr. and Mrs. Putnam, report that their daughter Ruth is also ill. There is talk in the village of an unnatural cause. The people in town hear of this and ask Reverend Hale, an expert in witchcraft, to come and determine if witchcraft is behind the children's illnesses. Hale learns that the girls were dancing in the woods and that Tituba can conjure spirits. A young girl accuses Elizabeth Proctor of being a witch and self-righteous church leaders insist she be brought to trial. The actions of the prosecutors are mean spirited, and neighbors become anxious to testify against their neighbors. 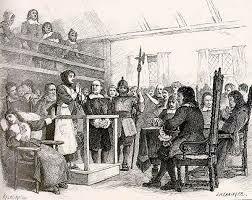 The Puritans had based their newly established society upon religious intolerance. They worked hard, were honest, and followed their religion strictly. Sexual desires were considered the devils work and it was the job of their ministers and the Bible to interpret the Lords will.